RTG (‘Road Transport Grade’) is a concentrated Heavy Goods Vehicle tyre sealant designed for On Road use in the tubeless tyres of Heavy Trucks, Semi-Trailers, Coaches & Buses, and other on-road vehicles over 5 tonnes that may travel at extended high speeds. It works perfectly with the high pressures used in these vehicles, unlike many tyre sealants. It prevents punctures, sealing the hole in the tread area the moment the puncture happens. It also extends tyre life by 20% on average (up to 40% in the case of steer tyres) as has been proven by a matched extended truck tyre test. OKO On Road RTG has been formulated to last longer in fast moving hotter tyres. It copes with the additional speed and heat and reduces the temperature inside the tyre. 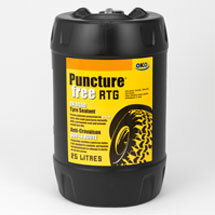 Should last 100,000 to 140,000 km (depending on usage, road quality and nature of the tyre). RTG should then be topped up through the valve stem if the tyre is still legal. Deals with loss of air and eliminates the puncture problem by providing a permanent seal caused by puncturing objects with a diameter of up to 8 mm. OKO RTG stays inside the tyre, ready to seal further holes as they occur. 25 litre drum is sold with a NEW heavy-duty all-alloy pump that is rinsed out after each use and is a one-time purchase. Unlike most others, it comes fully-assembled, works against higher pressures (up to at leat 60psi/4.1 BAR), adjusts in 50ml steps up to 250ml, is not made from plastic or rust-prone mild steel, and is ready to use. A tap on the nozzle enables clean, accurate delivery. Whereas some other sealants come in pails with messy removable tops that require assembly, these secure drums have a screw top that replaces easily to protect the product until the next use. • Achieving the Quickest Journey Time. OKO On Road RTG is the tyre sealant that trucks can be fitted with to help operators achieve these objectives. Gives Protection against Flat Tyres; Can eliminate downtime at the roadside. Reduces air loss and cools the tyre, hence extending tyre life. Comprises specially treated constituents of the highest grade, environmentally friendly rust inhibitors for anti-corrosion purposes, adhesion agents, gums and preservatives, held in suspension to provide a carefully engineered matrix. Product colour: Salmon Red. Viscous. Low Odour. Quantity to Apply – refer to drum label or the Dosage Calculator on this page. Normal safety precautions should be taken: wear gloves and protect eyes. Rinse product off any clothes that it may be spilled upon. If swallowed, see a doctor.